In 1942, in preparation for D-Day, the crucial issue of fuel supply for the tanks and vehicles of the Allied forces became a vital consideration for the military staff, charged with the planning of the landings in Normandy and the subsequent advance through France. It was realised that a reliance on oil tankers might bring with it problems of security and constancy in the supply of fuel, because of bad weather and attack by the Luftwaffe and German submarines. There was also the problem that ship-to-shore pipelines from the tankers would clutter up the beaches and obstruct equipment, men and vehicles from moving so freely about the beaches. To prevent an interruption in fuel supply, Arthur Hartley, chief engineer with the Anglo-Iranian Oil Company, developed the idea of a specially designed pipeline under the Channel, through which fuel could be pumped to storage tanks in France. The pipeline was to be based on submarine telephone cables with an armoured outer layer and a specially adapted core to accomodate the flow of fuel at pressure through miles of pipeline to France. The whole operation was known as Operation PLUTO. The fuel was routed from ports like Liverpool and Bristol through a network of pipelines to Dungeness and Shanklin and Sandown, finally being pumped under the sea of the Channel to France. The Isle of Wight section of this fuel supply line started in the New Forest at Badminston Common, where there were underground storage tanks, covered over in grass. A pump at Mopley Pond then pumped the fuel to Lepe, from where the pipelines ran under the Solent to emerge on the beach at Thorness Bay. From here, a buried pipeline ran from Thorness to Shanklin, where the fuel was stored in a large fuel head reservoir (code name TOTO) at Hungerberry Copse, south of Victoria Avenue, the main road from Shanklin to Newport. From a 1944 map, it would seem that from the Hungerberry Copse storage tank, the pipeline forked into two separate lines: one descending, via Shanklin Chine, to pumps along the seafront and another running across fields behind Shanklin, Lake and Sandown to Sandown Fort (now Sandown Zoo). Work on the installations on the Isle of Wight started in the summer of 1943 with the construction of the pumphouse buildings. There were 3 sites, each named with a letter: Site A, Site B and Site C. Sandown was Site A while Shanklin was termed Site C. It would seem that Site B may have been the Brown's golf course pumphouse cluster. But in a progress meeting on 28th March 1944, it was decided to rename Site C as "Site B". Presumably the original Site B was merged with Site A. The site at Sandown was allocated sixteen reciprocating pumps numbered 1-11 and 14-18 and two centrifugal pumps numbered 12 & 13. The Shanklin site consisted of eight reciprocating pumps numbered 19-24 and 26-27 and one centrifugal pump numbered 25. 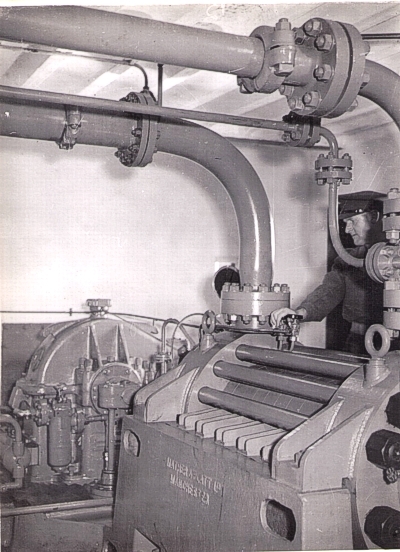 The erection of the pumphouses was due for completion by January 1944 and the installation of pumps was scheduled for both November 1944 and January 1944. In a progress meeting of 15th February 1944, it was decided to stop work on the Shanklin site to concentrate on Site A (Sandown site), due to the slow delivery of materials (such as flanges) and lack of adequate workforce. It was believed that Site A would be finished by 31 March 1944 and then work would start again on Site C, which was scheduled to be complete by the end of April 1944. By March 1944, construction of almost all buildings on Site A was complete. It was expected that the Shanklin site would be completed by 15th April 1944. By the middle of May, most of the work at Shanklin had been completed. By the beginning of July, the pumps at Shanklin had been water tested and by 5th August the pumps had been spirit tested and certified ready for operation. 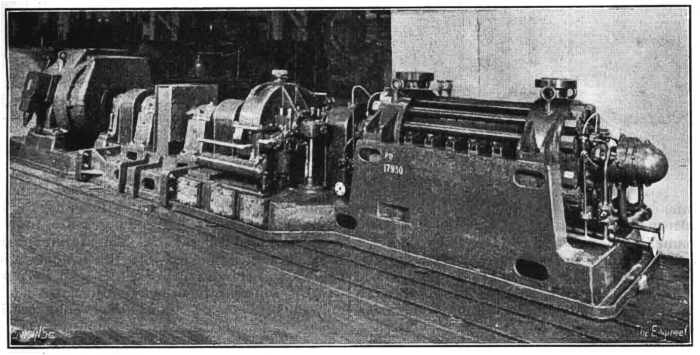 Caterpillar diesel engines (40 of the 60 total were shipped over from the USA) were installed to provide power for the reciprocating pumps, while the centrifugal pumps were powered by electric motors, connected to a high tension electric supply, specially routed in by the Isle of Wight Electric Light and Power Company to an adjacent transformer house. Valve pits were constructed between the pumphouse buildings in the vicinity of the cliff lift and camouflaged by covering them with suitable rubble effect mesh. On 20th June, 1944, the progress report states: "Stations 21/22 and 23/24: Completed camouflage on these two buildings is now being altered to form an overhead cover linking the buildings together, thus providing ease of access as well as concealment of various valve pits sited in ground between." 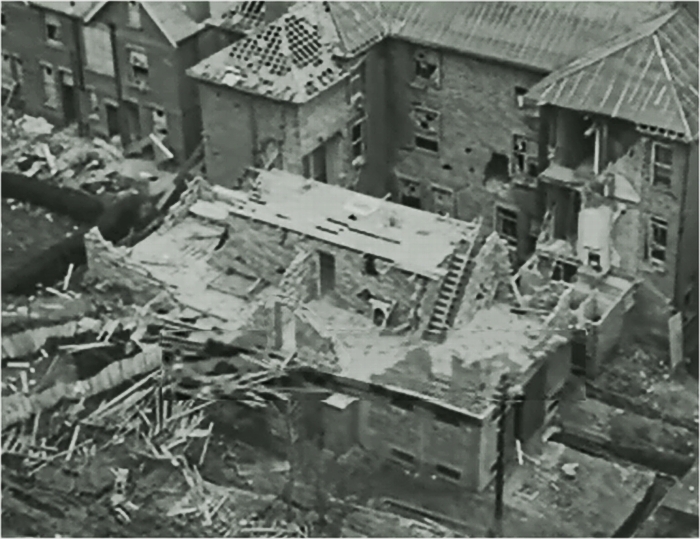 A silent black and white film, made in 1945 and held in the Imperial War Museum, shows footage of these pump-houses, filmed from a position to the east of the lift at the top of the cliff behind. 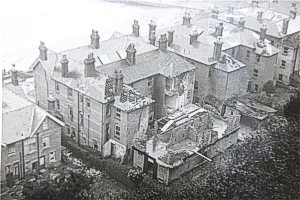 The Shanklin pumps were housed in purpose-built buildings, hidden amongst the bomb damaged houses and hotels along the seafront. Before the war, the buildings along the seafront between the lift and the present day amusement arcade were all apartments, rented out to holiday-makers. 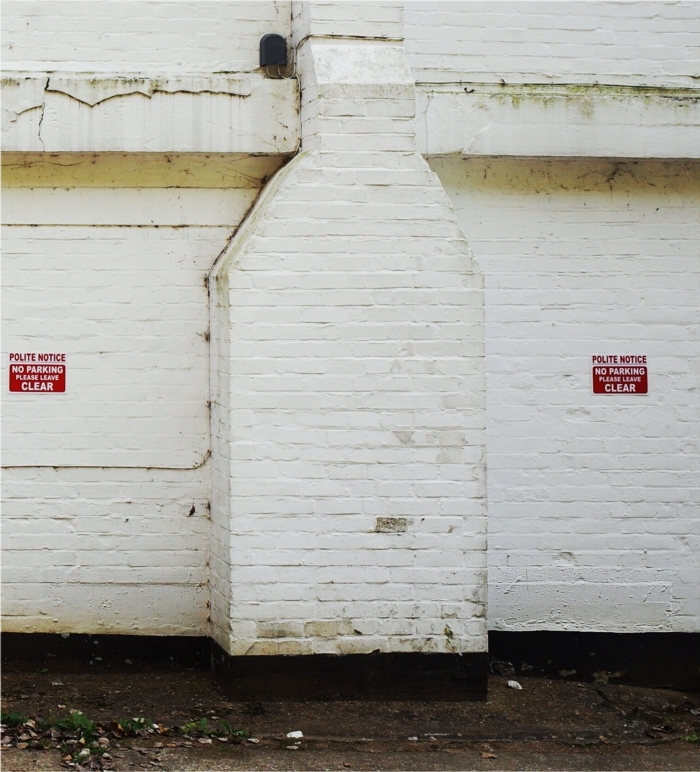 Two reciprocating pumps (number 19 & 20) were located in a building behind what is now the Shanklin Beach Hotel. Before the war, this was a semi-detached building, one side of which was a "board residence" called Ocean View, owned by Leslie Weston and the other side of which was apartments, let out by Mrs. Dibden. The pump building still exists as additional bed accomodation for the hotel. Originally, a single storey building, housing a pump, the ground floor now contains a number of rooms and an extra floor has been added on top. Blocked doorways and openings correspond to those in the film. The next pump house (containing pumps number 23 & 24) was situated at the foot of the lift and has been completely demolished. The last pump house (containing pumps number 21 & 22) was built adjoining the back of a Victorian building, now known as Sunny Beach Holiday Apartments. Before the war, this semi-detched building contained a boarding house, owned by Mrs. Blew (Warwick House) and the other side was a "board residence", owned by Mrs. Cureton (Esher House). The pump building has now been incorporated into holiday apartments. On the south side of the seafront, two of the pumphouses (containing pumps number 26 & 27) exist as The Lookout Cafe and Beach Amusements. These were probably originally garages, converted to house reciprocating pumps. 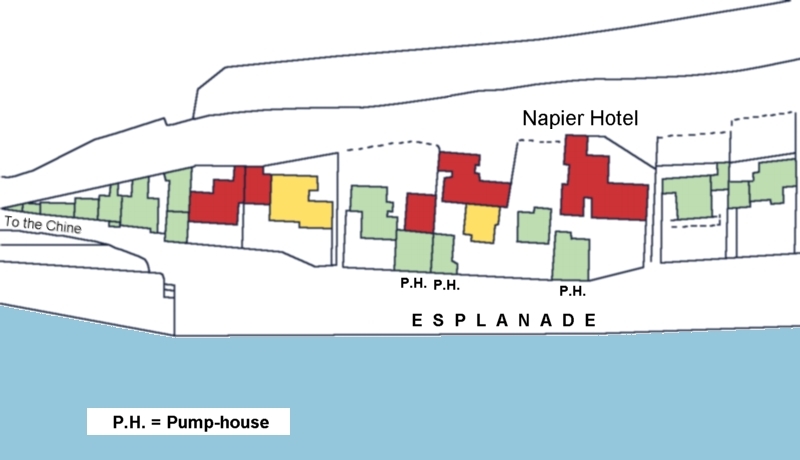 The other pumphouse was situated slightly to the north where a garden exists,belonging to The Napier block of flats. In his much quoted book, Flame over Britain, Sir Donald Banks, who was Director-General of the Petroleum Warfare Department during the War, provides much detail about the whole PLUTO operation. "At Shanklin a large 620.000 gallon tank (called "Toto") was erected in a small wood on the hill, the work being carried out entirely under the umbrella of camouflage netting of nearly an acre in extent. From there the oil was gravity-fed down forking lines to two batteries of pumps installed respectively at Sandown and Shanklin, about three miles from each other. It was part of all the plans to insure and re-insure against enemy action not only by dispersion and concealment, but by duplicating, so that if one lot of pumps was knocked out another could take its place. So two sea-lines were laid by Persephone across the bay connecting up the two stations laterally. 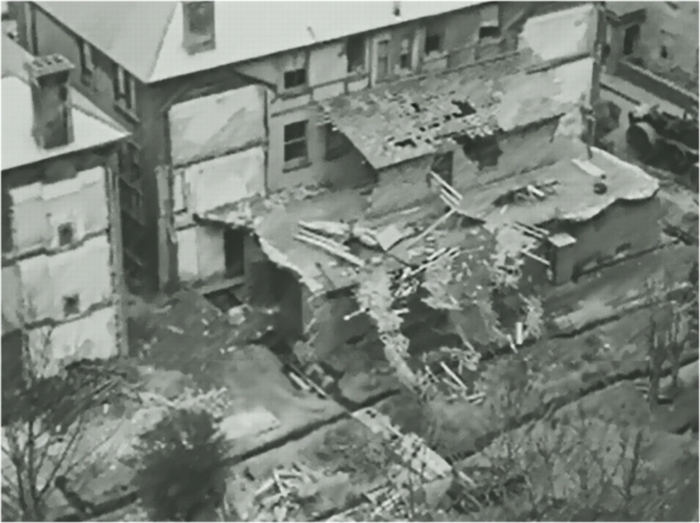 Shanklin had had an earlier visit from enemy low-flying planes which skimming in over the water under the Radar beams had devastated the picturesque row of Victorian hotels and villas that stood under the cliffs. Amongst these ruins we built our pump-houses and laid our lines, simulating on a new elevation twelve feet higher up the debris and wrecked dwelling-rooms, even the contents of the bathrooms, that strewed the ground, and hiding our mechanisms beneath this false floor. " Geoffrey Lloyd was only 17 in 1944 when he noticed the strange building works, taking place behind the hotels on Shanklin seafront. "I have another recollection of life in Shanklin at this time. In the early part of 1944 some strange construction work was begun at the rear of the hotels in Shanklin along the sea front. Behind, there were 150 ft cliffs and we could look down on this building work from above on the cliff path. All we could see were some buildings being constructed at ground floor level with an upper floor, but this was left only half constructed. On top of this floor was just a pile of builder’s rubble together with old beds, chairs and other household waste leaving the appearance of being merely a damaged and deserted building site. It was not until the D-Day landings that we discovered that this unfinished building was in fact housing pumping stations for PLUTO (pipe line under the ocean) — this was required for pumping vehicle fuel from England under the sea to the Normandy beaches to support the landings and the fighting in France. We were not aware of any pipes, etc. as all the beaches were out of bounds and heavily fortified." "The other half were at Shanklin, where a huge concrete-mixer was installed inside the ruins of the Royal Spa Hotel. Each time a lorry entered the building to load up with concrete etc., the doors immediately closed behind it. The same thing happened after it left to take the load along the seafront, and then behind the hotels, where buildings were erected to house the pumps. Some men were detailed to brush out the tyre marks which were made each time a lorry went along the front - in case enemy aircraft came over to take photographs. Everything had to be maintained as if nothing was taking place. I remember the workings of Shanklin Cliff Lift were removed to make way for the project, and I guess there may have been a shortage of timber during that period because we were detailed to strip quite a few of the hotels along the front of all their timbered floors. The wood was then used to shore-up the solid concrete 'bed' inside the buildings which had been put up behind the hotels. Once all the floors in the hotels had been removed, you could see the sky through those parts of the roof where slates were missing, as you looked up from the bare ground below"
In correcting the often-mentioned myth that the Royal Spa Hotel was destroyed by enemy bombs, Arthur Ord-Hume is correct in stating that the "key fact is that the hotel was neither destroyed nor badly damaged ..."
"Damage to the Royal Spa appears to have been restricted to those buildings behind the main structure. The staff accommodation building against Osborne Steps (described as The Cottage but not allocated separate status on the Census returns) was one casualty as was the ballroom together with those structures used for heating the water and originally created for the spa baths. The blast of this bomb apparently travelled through the building and blew out most of the glass in the Palm Court, in particular that forming the front wall. The rest of the building was mainly unharmed and the PLUTO modifications restricted entirely to the bath house and damaged rear buildings, today replaced by a public toilet block at the rear of the site next to the arcade which formed the original stables, and subsequent motor garages and, towards the Lift, by former office accommodation in the one-time Beach Cottages." Ord-Hume goes on to explain that the "PLUTO pumping equipment was created in, on, under or around the remains of the ferruginous baths complex and vehicular access was via the Esplanade, through the right-hand end of the now-open Palm Court facade and through the internal wall to the baths area. It was this area that was carefully brushed after each manoeuvre to remove signs of tyre tracks in the dust and accrued rubble." Although there were no actual pumps built in this area, it was certainly used for a large cement mixer, as described by Adrian Searle,and maybe the "pumping equipment" referred by Ord-Hume might concern valve pits or strainer pits. What is certain though is that the main body of the Royal Spa Hotel remained after the war and was renovated. "A few of the other buildings along the Esplanade were very quickly refurbished but the Royal Spa remained unoccupied and became more and more derelict as the years passed by. Clearance of the Palm Court and Winter Garden preceded partial demolition of the first building to the right (North) of these features. Now served with a flat and temporary roof, the building was painted white with garish red detailing and opened as 'Spa bars'. This survived for a few seasons into the 1960s." Indeed, a photo of June 1950, belonging to the author, shows the hotel complete and intact, although a little shabby. Directories also list the Royal Spa Hotel until the 1960s. The 1:25,000 OS map, published in 1961, also shows the Royal Spa Hotel as existing although the area to the north is shown as an empty space, where Glenelg and Templemore (the previous houses immediately to the north) had been demolished. On the 1977-78 OS map, the Royal Spa Hotel is marked as a public house with a car park to its immediate north. The dimensions of the three pump houses seem to have been the same. The existing one has a length of 55 feet, a width of 23 feet and it stands about 10 feet high. There are vents, measuring 4 feet by 1 foot, at the foot and head of the walls at various intervals. These vents were to provide sufficient ventilation in order to eliminate any danger from combustible gas or vapour. The walls were constructed from brick with a flat 14 inch concrete roof. The roof was made out of rectangular concrete units (about 5 feet by 18 inches) with a concave under-face. These were laid side by side on iron joists laid horizontally across the width of the building. Inside, a concrete blastproof partition wall divided the engine room from the pump room. "All pumps, ... , were divided from their driving units by fire walls, wall boxes being provided to take the driving shafts." 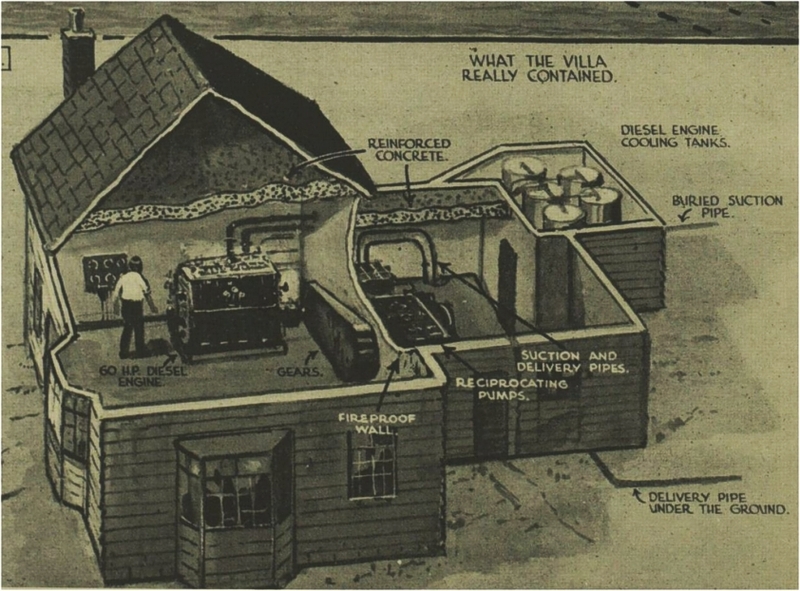 A diagram, showing the arrangement of a pumphouse, from a post-war manual. The concrete partition wall can be seen,dividing the engine room from the pump room. A picture from the Illustrated London News, showing a cut-away diagram, revealing the main features of a PLUTO pumphouse. "Pluto," Britain's Latest War Secret: How a Million Gallons of Oil Are Daily Pumped across the Channel. Illustrated London News, 02 June 1945, Issue 5537. 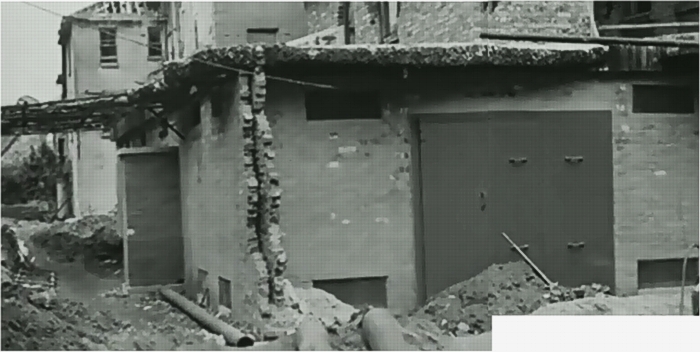 On the roofs, various sorts of fake bomb-damaged walls, doorways and windows were built round the edge and transversely across to simulate the damaged rooms of a house hit by a bomb. A bare staircase was also erected on the pump house behind the present day Shanklin Beach Hotel. 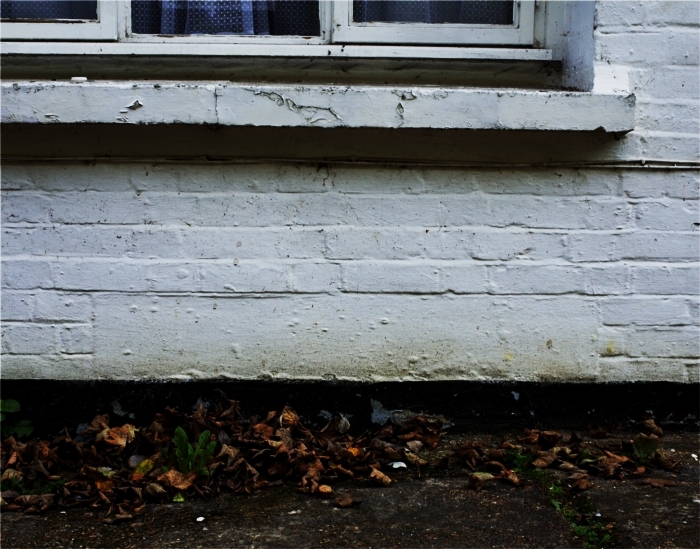 Attention to detail was paramount, so cavity walls were constructed and made obvious. 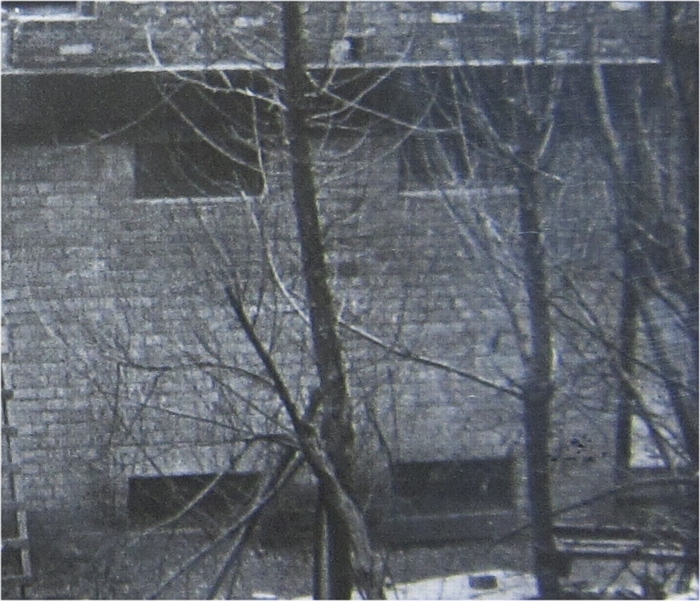 An irregular sloping wire mesh platform was also built off the side of the roof and strewn with rubble to simulate a pile of debris leaning against the wall of the building. Above the pumphouse next to the cliff lift, a shattered, hipped roof was constructed with small gaps between the tiles to simulate a roof shaken by a bomb blast. Captain Havinden was in charge of camouflaging and had to liaise with Headquarters Tactical Air Force to make sure regular aerial photographs were taken on a "fortnightly cover" basis and a 'camouflage report' accompanied the progress reports. These could be studied to make sure there was no trace or visible irregularity that might give German Intelligence a reason for further investigation. Anything conspicuous was noted for immediate remedial camouflaging. For example, when gaps were made in the beach scaffolding to allow the pipe through, "Captain Havinden pointed out that the gaps in the scaffolding at BAMBI were very visible and that further gaps would have to be created in order to correct this." Where the delivery pipes crossed the Espalande, this had to be carefully concealed and monitored. Pipelines were routed as much as possible along kerb lines, so that it blended in with the kerb. At other places, "Camouflage netting" was provided to hide pipes and pits. "The pumping station construction was under the supervision of a camouflage officer ; all plant which might be seen from the air was moved into position at night; and existing buildings such as bungalows, garages, ice cream factories, etc., were used as pump houses. Control photographs were taken at regular intervals by the R.A.F., and the complete success of all the precautions, often expensive and irksome, was proved by the lack of any known attempt by the enemy to interfere at any time. The camouflaging measures put in place were an unqualified success. The system of a long pipeline under the English Channel required fuel to be pumped under pressure for a considerable distance from the Isle of Wight to Cherbourg, a distance of approximately 70 miles. To achieve the necessary pressure, a bank of pumps were installed at pumping locations at Shanklin and Sandown. The set-up involved centrifugal pumps receiving fuel on the suction side from an 8 inch main pipeline, before delivering it to a number of reciprocating pumps arranged in series, to provide the necessary pressure needed to pump the oil the long distance to Cherbourg. The fuel then passed through strainer pits, which were built to receive valves with special filtering filtering screens, fitted to filter out any debris or mud particles that may have entered the fuel supply at an earlier point. The centrifugal pumps were manufactured by Mather and Platt and the reciprocating pumps were made by Frank Pearn & Co. Ltd. Both firms had had long experience in the fabrication of a range of different pumps. While Sandown was allocated 16 reciprocating pumps and 2 centrifugal pumps, the shanklin station contained 8 reciprocating pumps, numbered 19-24, 26 and 27 and one centrifugal pump, numbered 25. An example of a Mather & Platt centrifugal pump set up in the factory in Manchester. It has been directly coupled to an electric motor. These units were supplied to the Isle of Wight and Dungeness. ABOVE: An advert for a Frank Pearn reciprocating pump. Mechanical World Year Book 1917 (Emmott and Co of Manchester). LEFT: A Mather & Platt centrifugal pump in situ in its pumphouse. This is the same unit as in the photograph above of the pump in the factory at Manchester. However, here the electric motor is screened behind the partition wall in the background. 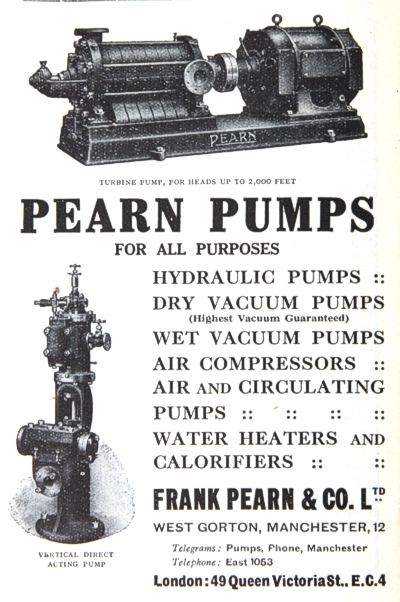 ABOVE: An advert for Frank Pearn Pumps. Mechanical World Year Book 1943 (Emmott and Co of Manchester). RIGHT: Article from the Manchester Guardian, 30 May 1945, reporting on the use of Frank Pearn and Mather & Platt's pumps. At Sandown, the sea defences in the from of scaffolding presented an obstacle in bringing the sealine pipes ashore. Consequently, by January, gaps in the beach scaffolding had been made to allow the routing of the sea pipes. At Shanklin, the pipes were routed across a gap in the pier, which had been opened to prevent any German invaders from using the pier as a landing stage. At both resorts, though, it was found that old-fashioned steam traction engines provided the best answer to the problem of hauling the heavy pipe sealines ashore. Captain J.F. Hutchings remembered their use in November 1946 in an article for The Naval Review. "To haul the ends of the Hamel pipe ashore an agricultural plough traction engine was used, having been specially sent across from England. Six of these engines with their drivers were wangled out of the Ministry of Agriculture and became great favourites with the Pluto party, " Steve " and " Sue " of Shanklin and Sandown being first favourites. It was Steve who arrived in Cherbourg to the astonishment of both French and Americans who had never seen anything in the war at once so archaic and effective. When finally dispersed Steve was proudly decorated with a brass plate, his name and services being inscribed thereon. This elevation to the peerage of traction engines gives him great distinction in agricultural circles." The Story of Force Pluto, Capt. J.F. Hutchings. The Naval Review. Vol. 34 No. 4. Nov. 1946.. The two traction engines with winding drums converted for hauling the Sea Lines have proved a success. A further 4 Traction Engines are being hired for use at Gurnard Point and Hengistbury. These will be transferred later for use at "DUMBO" and "BAMBI". The pumphouse that stands behind the Shanklin Beach Hotel as it was in 1945. In the top left corner, the present day Shoreside Inn can be seen. The pumphouse that stands behind the present day Sunny Beach Holiday Apartments as it was in 1945. A view looking northwards, past the above pumphouse. It shows the vents and metal doors. Also, on the left, can be seen the iron mesh platform, covered in fake debris, to provide camouflage screening. A view looking towards the cliff lift, showing the pumphouse built directly at its foot. The false bomb-damaged pitched roof was built to disguise it from enemy reconnaissance. Detail showing vents at the top and bottom of the pumphouse wall. View of the infilled vents at the foot of the wall, visible as horizontal scarlines. View of an infilled vent on the endwall of the building. resting on iron girders, spanning the width of the room. View of the ceiling of a restored pumphouse, showing concave roof sections in situ. A composite view from the cliff, taken from just north of the cliff lift, showing the rear of the hotels on Shanklin seafront in 1944. The same view as above, taken in 2014. The pumphouse is the ground floor of the white-painted extension on the left. What happened to the Pluto Installations at Shanklin? (i) The area itself has been extensively damaged, in part by air raids, in part by military defence measures, and in part by the Military in operation "Pluto". It is said to be difficult now to delimit the damage caused in these three successive phases, and therefore to say whether the area would come within the provisions of the 1944 Act." "... to rebuild the city on the old lines ... would be a dreadful mistake. It would be an exact repetition of what happened in the rebuilding of London after the Fire - and the results, in regret at the lost opportunity, will be same. While, therefore,the arrangements for rebuilding to the new plan should proceed with all possible speed, some patience and discipline will be necessary if the new-built city is to be a city that is really renewed." Indeed, such was the political enthusiasm for radical replanning of town centres that it has led historians to write of a "planning fever" gripping the political nation, supported by architectural and town planning professionals. Such was the Ministry and Isle of Wight Council's hopes for Shanklin seafront in the years after the war. In accordance with the Town and Country Planning Act of 1944, the first step was to obtain a Declaratory Order, allowing the issuing of compulsory purchase orders to acquire the land. In the meantime, the Council was trying to purchase property on the seafront but this proved to be a slow, difficult task. In a 1946 memo, written by R.B. Walker, the Regional Planning Officer of the Ministry, it was stated that many of the seafront landowners were presenting an obstacle to plans. "But it is thought that very few, if any, owners will agree to sell at anything like a reasonable price owing to the great demand for holiday accommodation." The officer was worried that "in the end the area will be rebuilt as pre-war". The same memo described the nature of the seafront, as it was in 1946. 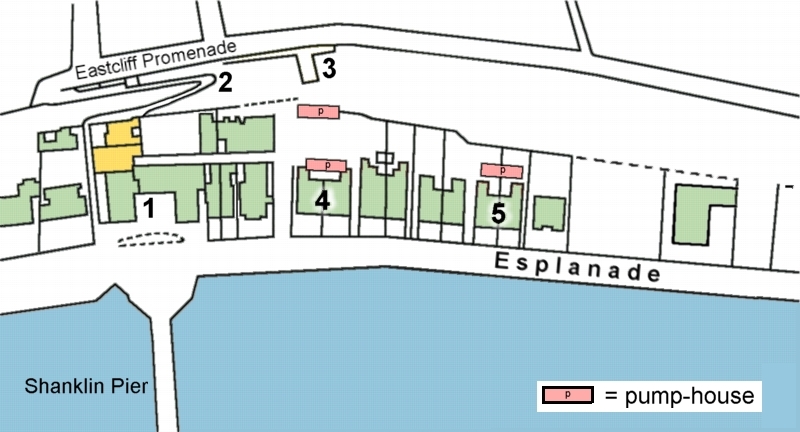 "As will be seen from the enclosed plan, the Esplanade area appears to be an ideal case for a Sect.1 proceedure. War damage is very extensive, and every building has suffered to a greater or lesser extent, and several buildings are demolished. Pluto damage is also present, but is small compared to war damage. The area is almost an island site, separated as it is by sandy cliffs from the remainder of the town. The pre-war development consisted of ugly Victorian houses converted to hotels and boarding houses and in my opinion this is entirely inappropriate to what is wanted in this area where large crowds converge daily on the beach during the holiday season, requiring holiday facilities, open spaces, shelters, cafes and restaurants, etc. There is ample space for the provision of hotels and boarding houses in the town proper." This memo ends by capturing the nub of the Ministry's fear: "On the information I have at present this seems to be a case where the Ministry ought to take action to ensure that the provisions of the 1944 Act are not ignored by a reactionary Local Authority." 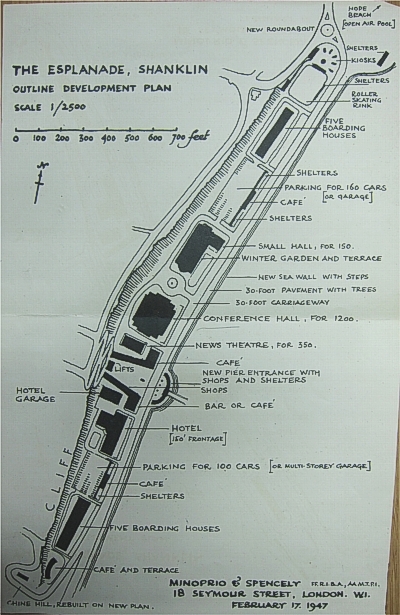 The sort of plan the Ministry had in mind for Shanklin seafront was illustrated by an outline plan drawn up by architects, Minoprio & Spencely of London. Charles Minoprio was an architect and town planner, typical of the professionals involved in the drawing up of new plans for rebuilding British war-damaged towns. He was known for his post-war plans for Chelmsford, Worcester and Crawley New Town. In 1946, the Isle of Wight Council favoured the compulsory purchase of the properties on the seafront and its redevelopment as a unified whole. The Sandown-Shanklin Urban District Council seemed to have misgivings and reservations and the Councils's Planning Sub-committee consequently advocated trying to encourage the UDC to apply for Declaratory Order. In July 1948, the M.P. for the Isle of Wight, Peter Macdonald, wrote to the Minister of Town and Country Planning, claiming that the slow progress on restoring the seafront was because it had "been held up by different Govt. Depts. for years." Possibly, this was because new applications had needed to be submitted, as a result of the passing of the Town and Country Planning Act in 1947. A year later, the Isle of Wight Council were still in the process of trying to get a Compulsory Purchase Order for the seafront area. The Ministry were awaiting evidence that the area was "an area of extensive war damage", while the Council were finding it difficult in obtaining this evidence, as the Ministry did not recognise damage by Pluto as war-damage. "Damage by Pluto is not recognised technically as war-damage, but in considering whether an area is one of extensive war damage it is possible to include contiguous or adjacent land which requires to be to be redeveloped with war damage land as a whole." The problem the Council was encountering was that a proportion of the war damage had been caused by the British military and not by enemy action. Just how much was proving somewhat problematic to decide. If they could show that the seafront was an "area of extensive war damage", then the Council would be eligible for a Declaratory Order and consequently could go ahead with a development plan for the whole seafront. In a letter of 8th May 1950 to the Secretary of the Ministry of Works, the Clerk of the Council pointed out that an application had been before the Ministry for some 18 months previously without a decision. As a result, the Council had decided to permit property owners to start restoring their buildings. One such property was the Royal Spa Hotel, whose owners were allowed to restore part of the hotel "in order to provide bar accommodation with living accommodation over." The Clerk pointed out that the Sandown-Shanklin Urban District Council were beginning to get frustrated at the delays and were impatient "to restore activity and life to the war damaged buildings on the Esplanade", given Shanklin's reliance on the holiday trade. He also mentioned that the owners of the Royal Spa Hotel were "anxious to open the bar accommodation at a very early date". By December 1950, the Ministry were still recommending that the Urban District Council make a compulsory purchase order on all property southwards from the Royal Spa Hotel. However, further owners were claiming and obtaining building licences and grants of government money to restore their properties. The Shanklin Lift Company had submitted an application for a building licence of £12,000 to restore the lift, which had suffered severe damage and had been put out of action for the war. A development plan never materialised, and so the necessary compulsory purchase order was never needed. Shanklin seafront was rebuilt on similar lines as before the war, with the Victorian hotels being restored and new buildings being erected on any cleared bombsites. No uniformity existed between these new buildings and all ideas of a planned, unified seafront development faded away. The pumphouses near the lift were demolished to give access to new lift that would be built. The pumphouse behind the Shanklin Beach Hotel was converted into extra room accommodation with a further story above. The pumping equipment in The Lookout Cafe and Beach Amusements was cleared out and the buildings went back to being tourist facilities. The pumphouse in front of the Napier Hotel was demolished and the area became a garden area. All other pumping plant, such as valve and strainer pits and all pipework, was also removed. An article about the PLUTO pumps from The Engineer 1945 All the pumps and the whole pipe system were designed for a maximum working pressure on the suction side of 600 lb. per square inch, and with 1600 lb. per square inch on the delivery side. Under normal working conditions the suction pressure was, howovor, about 50 lb. per square inch. Each reciprocating pump was designed to deliver approximately 40 ga1lons of petroleum spirit per minute, or 190 tons per day, when running at a speed of 45 r.p.m. The pump was driven by means of a V rope from a 60 B.H.P. Caterpillar Tractor Company oil engine, designed to run at a speed of approximately 1000 r.p.m. In 1942 the firm of Frank Pearn and Co., Ltd., of West Gorton, Manchester, was informed by the Petroleum Warfare Department and the Ministry of Supply that a number of high pressure pipe line pumps for petroleum spirit were urgently required, and that they were to be of similar design to those which the firm supplied in 1934 for the 1500 lb. pressure pipe line of the Kermanshah pipe line of the Anglo Iranian Oil Company, Ltd. 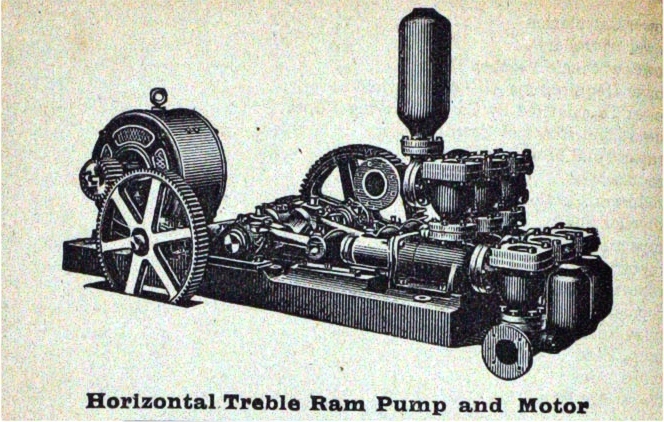 These pumps were three-throw ram pumps, of the horizontal type, with a bore of 3 3/4in. and a stroke of 8 in. In all, sixty 1600 lb. 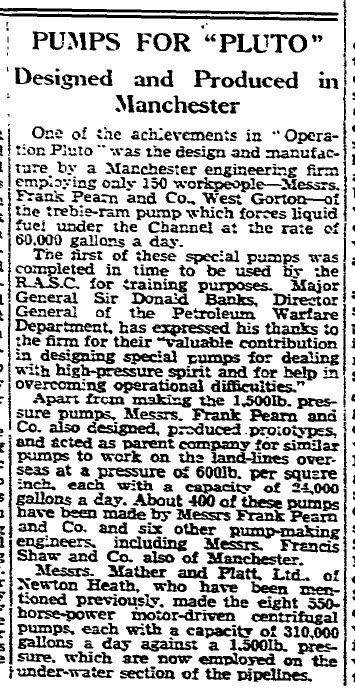 pumps were provided by Frank Pearn and Co., Ltd., with the assistance of Clarke, Chapman and Co., Ltd., of Gateshead. The crankshafts were of the three-throw type in forged steel, with forged steel connecting-rods with marine type ends, the crossheads being of the circular pattern, working in bored guides. All bearings were designed for heavy duty under continuous loading condition, and were made of bronze. A gear-wheel pump furnished lubrication for the working parts and the double helical cast steel wheel and forged steel pinion. So as to avoid the then bottle-neck in forgings, it was decided to adopt special cast steel barrels, which were supplied by David Brown and Sons, Ltd., from the Penistone Works. Careful X-ray and physical tests were made, and the barrel units were tested to 6000 lb. to 8000 lb. pressure by hydraulic means. When completed, each barrel was tested hydraulically to 6000 lb. and with paraffin to 3000 lb., a test which was followed by an immersion in water, with an internal air pressure of l00 lb. per square inch. In order to facilitate production, each barrel was made as a separate unit, embodying suction and delivery valve chests, with valves under separate covers, the three barrels being coupled together by cast steel pipes of the same material as the pump barrels, and incorporating by-pass and relief valve in one unit, with a solid drawn steel pipe as the return to the suction. The valves and seats were of stainless steel. The Pearn patented system of gland sealing with high-pressure lubricating oil to the pump ram stuffing-boxes, maintained at a pressure higher than that in the pump barrels, was employed, the oil being delivered to the stuffing-box glands by a three-throw pump chain driven from the first motion shaft. The centrifugal pumps were designed and built by Mather and Platt, Ltd., of Manchester. When the Petroleum Warfare Department inquired for these pumps, there was going through the works a series of multi-stage pumps for an Australian contract, and consent was obtained to use one of these existing pumps for experimental service. It was driven direct by a Mather and Platt 360 B.H.P. motor, at a full load speed of 2945 r.p.m. The motor used was a pipe ventilated machine of the squirrel-cage type, arranged for direct-on starting, with a starting current of four and a half times the full load. The supply was three-phase, 50 cycles at 3300 volts. On the later pumps installed at the Isle of Wight and at Dungeness, as will be seen from the engraving we reproduce of a pump assembled on the test bed at Park Works, a speed increasing gear, which was supplied by Francis Shaw, of Manchester, was introduced between the pumps and motor. Each of these pumps had a designed output of about 214 gallons of petrol per minute, or 1000 tons per day, at a delivery pressure of 1500 lb. per square inch. The pumps ran at a speed of 3430 r.p.m., and were driven by 550 B.H.P. motors running at a speed of 1470 r.p.m., and driving through the 1470/3430 speed-increasing gear. The motors were also of the pipe-ventilated type of squirrel-cage design, with direct-on starting, with a starting current of four times full load . The three-phase current was supplied at 50 cycles and 3300 volts. All pumps, as will be seen from one of the accompanying engravings, were divided from their driving units by fire walls, wall boxes being provided to take the drive shafts. The site chosen at Dungeness is some 3 miles in length and about 1 mile in depth, and it is split up into groups for purposes of easier control. Each group has its own control centre, and emergency control centre, to which it is connected up by telephone. Each of the five group control centres is, in turn, connected again by telephone to a main control centre, an illustration of which were produced herewith. In this main control centre are fitted pressure gauges from both high and low-pressure mains, temperature recorders, and a control panel showing which valves - there are over 500 main valves - are opened or closed, the units in operation , under maintenance, or ready for running, and the throughput figures hour by hour. The various units take their suction from a ring main and discharge into four high-pressure bus mains running parallel to the coast. From these bus mains, which have isolating and balancing valves, the lead-offs to the sea lines are taken, and at the start of each sea line there are twin high-pressure filters fitted in order to preclude possibility of any dirt or sediment becoming lodged in the pipe cable. There is also an anchor block to anchor firmly the shore end. 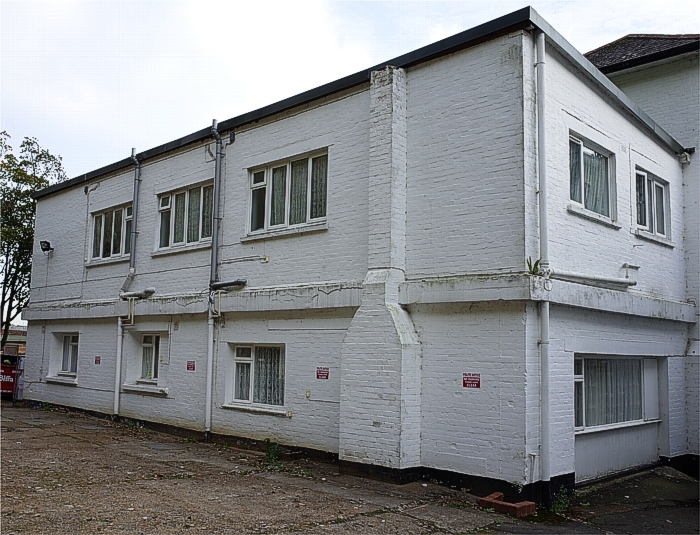 Considerable difficulty was experienced in finding suitable accommodation for the pumping units, and for camouflage reasons existing buildings had to be used wherever possible. In consequence, pumps had to be housed in normal seaside bungalows, wooden boat houses, seaside cafes, and old forts, none of which from their outside appearance had been altered in any way. But inside the division walls were gutted and a bullet and blastproof concrete wall was built inside the house to form an engine room or pump room. HLG 79/248 Shanklin esplanade: war damage redevelopment, 1945-1951. WO 272/11 Operation PLUTO: progress meetings, 1943 June - 1944 August. WO 272/15 Operation PLUTO: notes on progress in respect of supply and distribution for operation.